Yacov Sharir is a choreographer, dancer, technologist and innovator. He is Associate Professor of Theatre and Dance at the University of Texas-Austin, and Artistic Director of the Austin-based Sharir Dance Company. After graduation from the Bezalel Academy of Arts, Professor Sharir studied at the Jerusalem Academy of Music, the Bat-Sheva Dance Company School, the Stuttgart Ballet, and the Ballet Theatre Contemporaine in Paris. He has performed under the direction of Martha Graham, Jerome Robbins, Jose Limon and Anna Sokolow, among others. A dual citizen of the U.S. and Israel, Sharir is the founder of both the American Deaf Dance Company and the Sharir Dance Company, a professional dance company of the UT College of Fine Arts. As a multiple recipient of the National Endowment for the Arts Choreographic Fellowship, he has choreographed for such companies such as the Bat-Sheva Dance Company, Hartford Ballet, Dallas Ballet, the Kibbutz Dance Company of Israel and the Utah Repertory Dance Theatre. 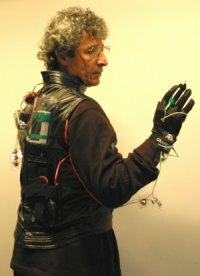 He was a recipient of an "Arts And Virtual Environments" two year fellowship awarded by the Banff Center for the Arts and is engaged in extensive international lectures and workshops directly related to the issues of virtual environments, cyberspace and computerized choreography. He is considered one of the pioneers in the field of dance and technology, and recently been involved in numerous research and cross-disciplinary productions, including a collaboration with intelligent textile designer Barbara Layne (Hexagram, Montréal). He is currently completing his PhD at the Planetarium (Plymnouth). Yacov Sharir and Wei Yei, working on the Future Physical performance commission "Intelligent City" along with Sophia Lycouris and Stan Wijnans, demonstrated a wearable protoype at the WEAR-ME!! Network Exchange, showing three iterations of wearable computing suits which they have developed in the past two years.